2019 NDMTA Conference June 19-21 in Grand Forks!! Time to meet old friends, make new ones and talk shop! Wynn-Anne Rossi, Dr. Sariaki Sugiura, Drs. Dianna and Erik Anderson, Matthew Lorenz and Mathew Sebald are featured at the exciting NDMTA Conference! Downloadable Registration Form and updated Schedule as well as information about the featured clinicians and performers can be found on the Conference Page of this website. Registration must be postmarked before May 31 to avoid late the registration fee. Hotel accommodations must be reserved by May 19th to qualify for special rates. Time to make plans for a great time! See you at the Conference!! Gloria Bethke of Grand Forks, ND has been selected to be honored as the 2020 MTNA Foundation Fellow by the NDMTA. Gloria will be honored at the 2020 MTNA Conference Gala in Chicago with the contribution of $1500 to the MTNA Foundation in her name. Congratulations to the participants and winners in the Iva Fillebrown Scholarship Competitions! In the Junior High Division, the winner was Ariel Bahn, student of Sue Nagel. In the Senior High Division, the winner was Hanson Chen, student of Dr. Robert Grove. The judge for the competition was Dr. Jay Hershberger of Concordia College, Moorhead. Pictured are the participants and winner in the Senior High Division (left to right): Hanson Chen (winner), Tessa Hultin, Sophia Lucht, Ethan Kessler and competition judge, Dr. Jay Hershberger. Students participating in the Junior High Division of the 2019 Iva Fillebrown Scholarship Competition are (left to right): Eleanor Culloton, Kevin Johnson, Ariel Bahn (winner), and Zakk Volk. NDMTA Represented at the MTNA Conference in Spokane, WA, March 16-20th. NDMTA President, Vangie Parker Johnson, Vice President Dianna Anderson, Anne Morris, and Beth Klingenstein attended the recently held MTNA Conference in Spokane, WA. Beth Gigante Klingenstein was elected to the position of Secretary-Treasurer of the MTNA at the recently held MTNA Conference in Spokane, WA. She will serve a two year term. 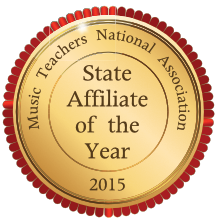 Beth has been an active member of the NDMTA, serving as president of the state organization for two terms. She also has served on the MTNA board of directors as a director for the West Central Division. Corrine Nustad, member of the FMMTA was honored at the 2019 MTNA Conference in Spokane, WA, as a Foundation Fellow. $1500 raised by the NDMTA was given in her name to the MTNA Foundation. Corrine received a pin and a certificate of recognition as a Foundation Fellow. Corrine's biography can be read below. Corrine Nustad couldn't attend the MTNA Convention and Vangie accepted Corrine's award on her behalf. Outgoing MTNA President Scott McBride Smith, outgoing SPAC Chair Noreen Wenjen, and MTNA CEO Gary Ingle at the 2019 MTNA Conference. Vangie Parker Johnson and Anne Morris with the venerable Marvin Blickinstaff - a great gentleman, teacher, and mentor. The LAMTA Honors Recital featured students who achieved a good memorized performance at the November 2018 Music Rally held in Langdon. Sam Wiederholt, Bismarck, teacher Priscilla Keogh, was the winner of the elementary competition. In the Jr. High competition, Kobey and Keven Jia, Bismarck, teacher David Poffenberger were the winners. In the Sr. High division, 1st place went to Ella Zhang, Grand Forks, teacher Gloria Bethke, 2nd place to Carissa Dalen, Dickinson, teacher Michael Langer, and honorable mention went to Megan Doering, Minot, teacher Dianna Anderson. What do you get when you combine 62 enthusiastic piano students, their 10 teachers, a supportive music store and a keyboard from generous international music corporation? You get the Badlands Music Teachers' Association Piano Extravaganza, a multi- piano event, which took place on Dec. 2nd, 2017. A variety of Christmas duets was performed by the students and teachers on 4 Yamaha Clavinova's provided by Jacobsen Music of Dickinson. At the conclusion of the concert a drawing was done for a keyboard donated by the Yamaha Corporation. The lucky winner was Jack Olsen. Yamaha also sent a box full of sunglasses for the kids, which made for a very special group photo! Oktoberfest at the Fargo Moorhead MTA October meeting with the Brian Breitbarth Band and FMMTA's own Nancy Harsch as soloist. Oktoberfest at the Fargo Moorhead MTA! Is that the polka or waltz? Dr. Geraldine One and John Letellier present "Back to School with Four Hands...the More the Merrier" to the Fargo Moorhead Music Teachers Association. Herb Parker gives an entertaining and creative presentation on composers from the Romantic period. 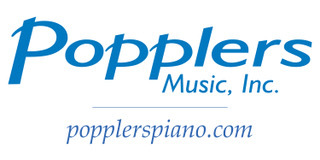 The NDMTA thanks Popplers and JW Pepper for their support of the NDMTA website.